What Is Tri Sprintec Used For? Tri-sprintec is a form of birth control that uses estrogen and progestin to prevent you from ovulating. It can also help to prevent the mucus in your cervix from being hospitable to sperm and stop the sperm from getting to the egg. Lastly, it makes the lining of your uterus unable to accept a fertilized egg. You may know this medication as “Ortho-Tricyclen”. This article will help you understand more about this form of birth control and tips for using it properly. Tri sprintec is one of the many birth control methods for preventing pregnancy. It is also commonly used in females that are age 15 and older to treat severe cases of acne vulgaris. The medication is only used in females that have started their monthly period. It is only used for acne if you have not responded to other acne medications, so your doctor may have you try several other treatments for acne before starting tri sprintec. This medication is sometimes used to help regulate menstrual cycles, ease painful periods, reduce the amount of bleeding during periods, and reduce ovarian cyst formation. It can also help endometriosis, a painful condition where the lining of the uterus grows outside the uterus. When used as a contraceptive, tri sprintec needs to be taken exactly as directed. One tablet must be taken every 24 hours. For example, if you take your pill at 8:00 a.m. then you must take your pill precisely at 8:00 a.m. every day. Taking it too late increases the risk of getting pregnant. When used for acne, the medication is taken at the same intervals as for contraceptive. Your doctor will advise you the best way to use it to treat your acne, but understand if you are sexually active you will still need to follow the strict timing of dosage guidelines to prevent unintended pregnancy. Even when used for acne, you will need to take one pill at the same time each day to prevent the release of hormones that trigger ovulation and acne breakouts. The Sunday Start method: you will be taking your first pill the Sunday after your start your period. If you start your period on a Sunday, take your first pill right away. You will then take one of the active pills daily for 21 days, then one of the inactive or white pills for 7 days until the pills are gone. After you finish the pack, you start a new pack the very next day which should fall on a Sunday. If you start your period on a Wednesday, wait until Sunday to start your pills. The Day 1 Start method: you will take your first pill on the first day of your period, no matter what day it is. Continue to take one pill each day for 21 days and then the inactive or white tablets for 7 days. When you finish the 28 day cycle, start a new pack of pills the very next day. If you are staring birth control after pregnancy, the doctor will most likely have you wait until the 4th postpartum week if you are not breastfeeding. Your doctor will advise you how to take the pills, even if your periods have not returned. One dose(week 1, 2, or 3) – Take the missed dose right away, even if you already took your pill you can take two at once. Two doses (week 1 or 2) – Take two tablets today and two tablets tomorrow. Keep taking your pills each day until the pack is gone. If you miss two pills, use another method of birth control for one week. Two doses (week 3) – If you miss 2 doses the third week, begin using another method of birth control for the next week. Toss out the old pack of pills and begin a new pack right away. Three tablets in a row – Begin using another method of birth control, toss out the pack and start a new pack right away. Even though overdose is not usually life threatening, it still requires medical attention. Call poison control right away for advice and/or get to a hospital emergency room. Do not induce vomiting and do not take any more doses until you have seen a doctor. Always keep any medications out of children’s reach. These side-effects are usually only in the beginning of treatment. If they persist beyond three months, talk to your doctor about changing medications. Do not stop taking birth control without talking to your doctor first. See your doctor for a full physical before starting birth control and then yearly. You will need to have the following things checked: blood pressure, pelvic exam, Pap smear, and breast examination. Let your doctor know if you have a family history of reproductive cancer or breast cancer. You also need to tell your doctor if you smoke or have a history of heart disease or blood clots. The following drugs can reduce the effectiveness of tri sprintec: rifampin, seizure medications, ampicillin, and tetracycline. 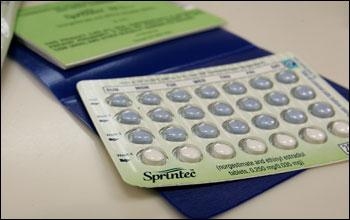 If you have to use these medications use another form of birth control. It may also alter the results of some laboratory tests. Taking tri-sprintec and smoking cigarettes places you at high risk for blood clots, strokes and heart attack. As you get older the risk increases. The more cigarettes you smoke (over 15 daily) the higher the risk. Doctors usually advise to quit smoking or use another form of birth control if you can’t quit.